Washington is a community property state. In a community property state, any money earned or property acquired by either spouse during a marriage is the rightful property of both spouses, according to RCW 26.16.030. The same is true for any debts incurred over the course of the marriage – both partners are responsible for them. For example, if a wife in a marriage purchases a car, the car legally is considered to be both partners’ property. Community and separate property – property that belongs to just one spouse, such as property acquired before marriage – may be part of a divorce agreement in Washington. If you’re getting divorced, make sure you consider Washington’s laws regarding property division. Seek help from a Bellevue divorce lawyer to ensure you exercise all of your rights during the process. Community property is divided as equally and equitably as possible. But what confuses some is whether certain property is considered community or separate property. As noted, community property is property acquired during the marriage, and this property is subject to division when getting a divorce. Separate property includes property that either spouse had prior to the marriage, as well as gifts or inheritance either spouse receives. Separate property remains the property of the spouse who acquired it, though in certain circumstances, separate property might be included in the property division. When considering division of assets in a divorce, the court will account for several factors like those listed below. Economic situation of either spouse. Amount of property and value of property. Meanwhile, the court may consider either party’s contribution to or sacrifices for the marriage. If you chose to help your spouse with his or her career instead of focusing on your own, for example, you may receive a greater amount of the community property assets. Other factors also might be relevant, so consult a Seattle division of property lawyer in Bellevue for information more specific to your case. The fault for the marriage generally is not a factor when dividing property. If one spouse had an affair, for example, it might make sense to some – such as the other spouse – that the cheating spouse receives fewer assets. But Washington is a no-fault state and does not consider fault when dividing property after a divorce. However, if the cheating spouse used community property assets – like ran up credit cards or used funds from a shared bank account – then it might be a factor when considering property division. This is a matter that deserves more careful discussion with a attorney. Going through a divorce can be a challenging and frustrating process. 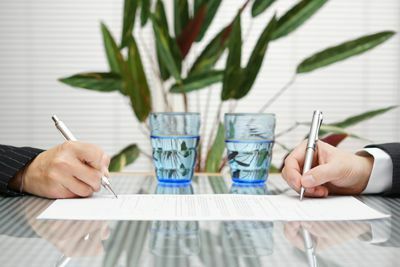 To make sure that your rights are represented during the process of dividing property and assets, having a divorce attorney on your side can help. At the Law Offices of Molly B. Kenny, an asset division attorney will work hard to make sure you receive a fair deal and can represent your rights throughout the process. If you need help with mediation, divorce or a property dispute, our attorneys are ready. To understand your options, call our offices now at 425-460-0550 or contact us online to set up a consultation with a Seattle division of property lawyer.